Louisville, Ky. – October 15, 2018 –Signature HealthCARE is marking Chaplain Appreciation Day by highlighting the stories of chaplains and spiritual leaders across Signature’s ten states. Because the spirituality pillar is integral to the company’s culture, Signature chaplains are integral to the quality of life and community for our patients, residents, elders, families and stakeholders. These stories and more showcase the joy that Signature chaplains bring each and every day. “My purpose in life is to do three things: Encourage, Equip and Empower others no matter gender, status, or ethnicity, faith tradition etc. 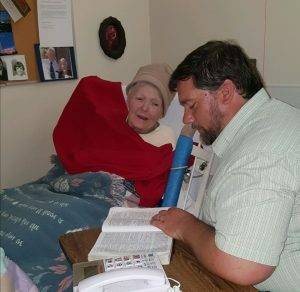 This is what motivates me each and every day.” – Chaplain Robert White, Marietta, Ga.
“To me this is so much more than a job, to have the heart, drive, courage and motivation to be a chaplain in long-term healthcare must be a calling from the Lord.” -Chaplain George Smith, Lawrenceburg, Ky.
“I know that I am fearfully and wonderfully made, precisely placed in my location at this exact moment in history to make a difference for God. That is why I can spread joy.” – Chaplain William Seymour, Galion, Oh. This entry was posted in Uncategorized on October 12, 2018 by ccrenshaw.